On this scenario, we will use PIM SSM. 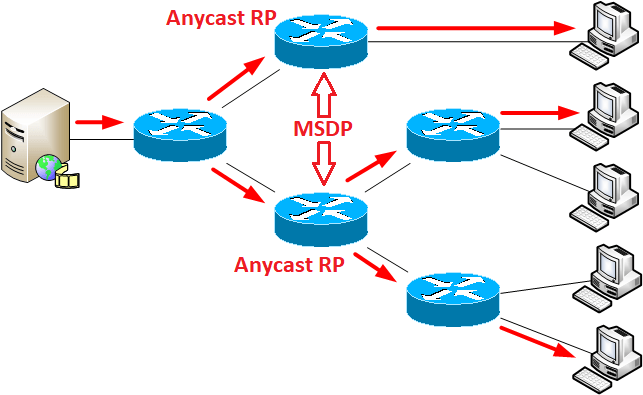 ASM (Any Source Multicast) is defined as receivers joining groups and receiving traffic from any source. But, SSM instead is utilized to identify a specific source a receiver wishes to receive traffic from. We still use PIM sparse-mode but RP are no longer required since receivers subscribe directly to a source. Another important point, with PIM-SSM we need to use IGMPv3. IGMP Version 3 supports source filtering, which is required for SSM. With the command ip pim ssm default: in this case the SSM group will be the default multicast-SSM group range 232.0.0.0/8. 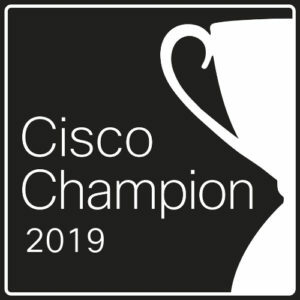 Or with the command ip pim ssm range ACL: in this case, the SSM group will be defined by the access-list and can be outside the default SSM range of 232.0.0.0/8. 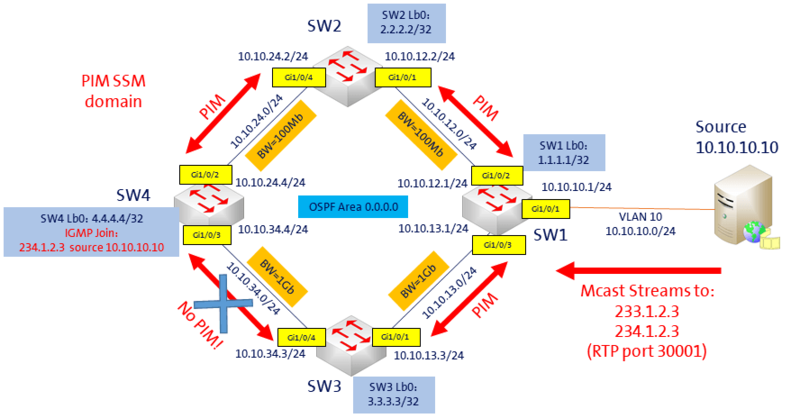 Now, let’s make an IGMP join for the group 234.1.2.3 on the loopback0 of SW-4. Here, we use IGMPv3, where we need to specify the source (10.10.10.10). Now, let’s see what happens if we cut the link between SW-3 and SW-4. We continue to receive the traffic. Now, let’s put the link between SW-3 and SW-4 back in service, but without PIM between SW-3 and SW-4. It seems there is a RPF problem, right? We saw on the lab-1: the source IP address in the packet should be reachable via the receiving interface. 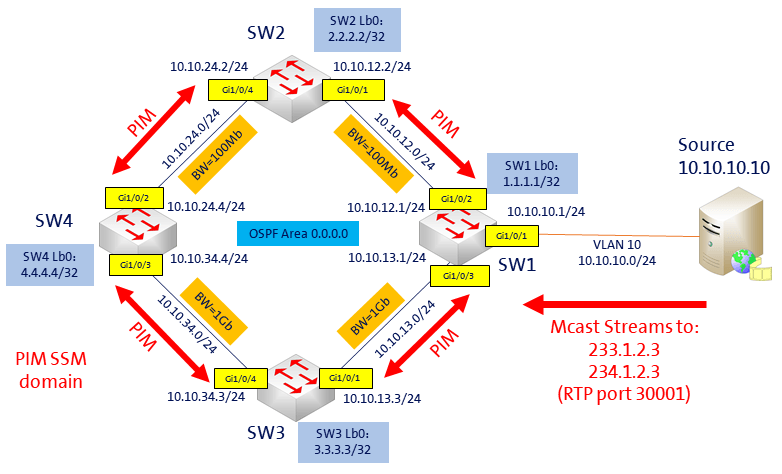 In this case, the route to reach 10.10.10.10 is via SW-3 (OSPF with higher bandwidth) and the multicast traffic comes from the interface to SW-2. So, we have a RPF failure here. We can see on the debugging, the RPF changes from 0.0.0.0 to 10.10.24.2 via Gi1/0/2.